It's been building and building for weeks now. Maybe even months. Well, the wait is almost over. High school football is back, in full force, Friday night. All three of the area teams — Sherwood, Tigard and Tualatin — are taking high hopes into the 2018 season, and all three squads will open the upcoming campaign with home contests on Friday. 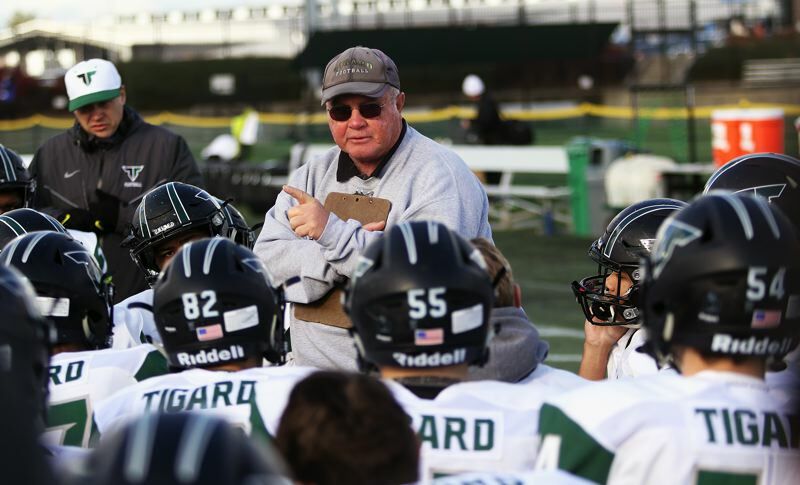 Tigard, which shared the Three Rivers League title last year, while going 10-3 on the season and reaching the semifinal round of the Class 6A state playoffs, will start its season by hosting Sunset in a non-league game starting at 7 p.m. at Tigard High School. "We've got a nice mix of returning starters as well as players who have worked hard and have developed," Tigard coach Craig Ruecker said. Among those returning starters for the Tigers is sophomore quarterback Drew Carter, who took over the starting role four games into the 2017 season and took off with it. Other key returnees for the Tigers include junior receiver/defensive back Max Lenzy, senior lineman Isaia Tavita Porter, senior running back Malcolm Stockdale, senior linebacker/tight end Noah Jackman and senior linebackers Mitchell Cross and Carter Dennis. Cross, who played at tight end on offense last year, and Dennis, who played at fullback, are moving to the offensive line for the Tigers this year. Sunset went 5-5 on the season in 2017, earning the No. 2 spot out of the Metro League. The Apollos are led by junior quarterback Callum Craig, senior receiver Nick Niedermeyer and senior inside linebacker Kaden Williams. Tigard and Sunset last met in the second round of the 2014 state playoffs, with the Tigers getting a 42-20 victory. Tualatin will open its second year under coach Dan Lever by hosting Southridge on Friday in a non-league game starting at 7 p.m. at Tualatin High School. A year ago, Tualatin went 7-4 on the season, placing fourth in the Three Rivers League and reaching the second round of the state playoffs. The Timberwolves return senior Kyle Dernedde, who is starting his third year as the team's quarterback. And, while Tualatin lost standout running back Kainoa Sayre to a season-ending injury, the Wolves still have plenty of weapons on both sides of the ball, including junior tight end/linebacker John Miller, senior running back/defensive end Dominique Loggins, lineman Dane Norlin and senior receiver/defensive back Jett Searle, just to name a few. Southridge, which placed fourth in the Metro League a year ago, while going 4-6 on the season, also has some strong returnees, including senior tight end/linebacker Kade Hustler, senior receiver Keyvaun Eady and senior running back Blake Sims. Tualatin, prior to Friday's game, will also honor the late Ken Lester, who was a longtime freshman football coach in the Tigard Tualatin School District. Sherwood, which went 5-6 last year while reaching the semifinal round of the Class 6A state playoffs, will be moving to the Pacific Conference this year after spending the past four years in the Three Rivers League. The Bowmen will open their season by hosting Sandy, a familiar foe from Sherwood's years in the Northwest Oregon Conference, in a non-league game starting at 7 p.m. at Sherwood High School. "It's an exciting time," Sherwood coach Greg Lawrence said. "The kids have bought into everything we want them to do. I'm excited for the season." The Bowmen look to boast a powerful offensive and defensive front going into the 2018 season. Senior Seth Bernhardt and junior Gavin Evans are battling for Sherwood's starting quarterback spot. The Bowmen also have plenty of other offensive weapons, including senior running back Ryan Scroggin and senior receiver Michael Klapp. Sandy, which is moving up to the Class 6A level this year, went 7-3 a year ago while playing in the Class 5A ranks. 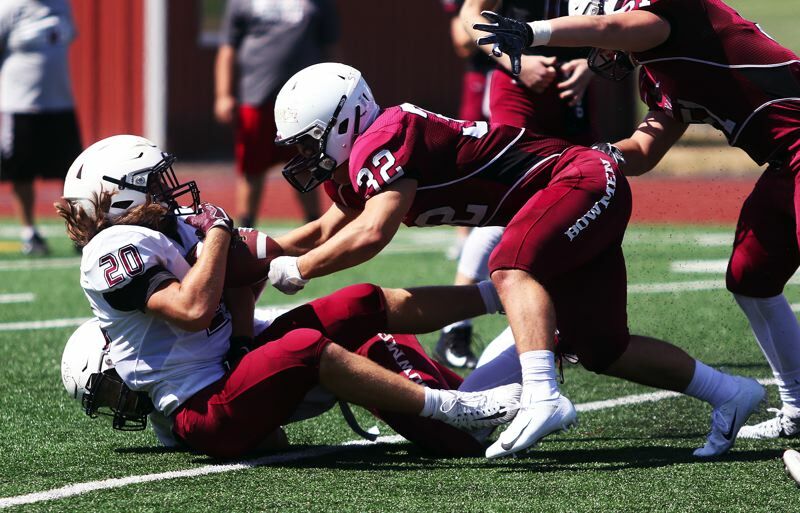 Sherwood and Sandy last met in 2013, with the Bowmen getting a 55-20 victory. In other season-opening games on Friday involving Three Rivers League teams, West Linn will face Central Catholic at Hillsboro Stadium, Lakeridge will play at Jefferson, Oregon City will travel to Grants Pass, Lake Oswego will host West Salem and Canby will play at Lincoln. All of those games start at 7 p.m. In other season-opening games involving Pacific Conference teams, Glencoe will play Hillsboro at Hare Field, Newberg will travel to South Salem, McMinnville will host Milwaukie and Century will play at Aloha in 7 p.m. games. Liberty will play at Sprague at 7:15 p.m.